How funny is it that we had purchased a LivingSocial deal for this place more than a year ago, waited past the expiration date, and still kept it to use? After all, they're supposed to still honor the price you paid for the certificate after it expires (in this case, we paid $12). However, perhaps we had waited just too long because when we went in, there was a sign saying that new management was there and no coupons would be accepted. WELL THEN. I even contacted LivingSocial after this fact so they said that next time, I'd be able to use mine. 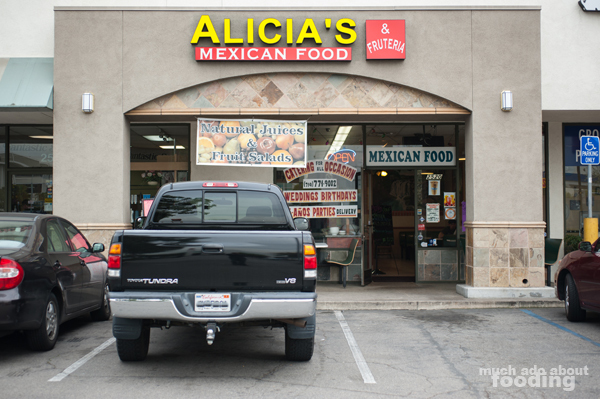 I would if the food was mindblowing but I'd say this was just a regular ol' casual Mexican food joint. We got started by our friendly waitress with their complimentary chips and beans. The chips were nice but the beans confusing in both sight and taste. 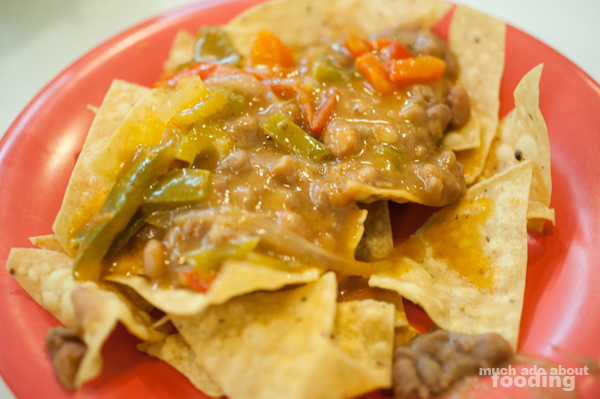 It looked like two varieties had been used of both refried beans on the bottom and a bean-y sauce on top. I believe we just munched on this briefly before our actual entrees came out. 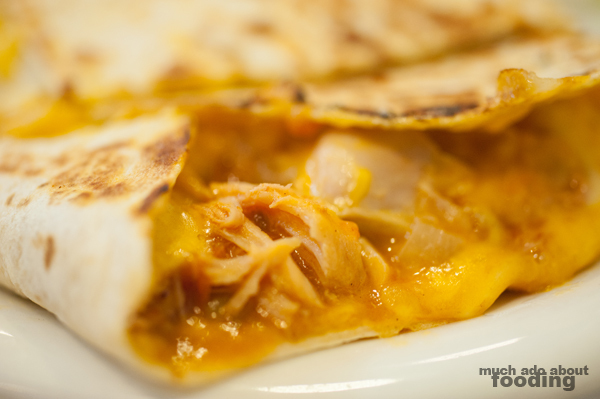 He had a hankering for some cheesy goodness so a chicken quesadilla was the food of choice. 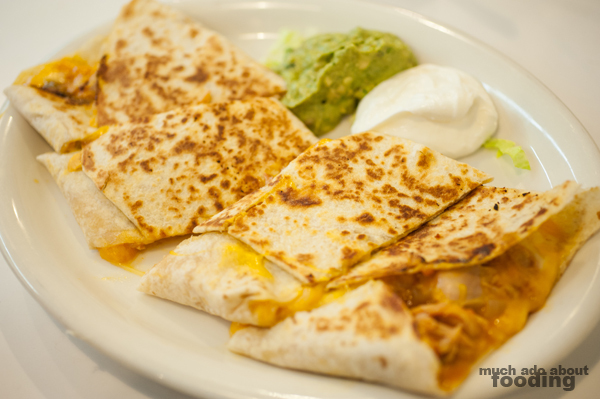 A sizeable portion with large dollops of sour cream and guacamole, the dish had us wondering whether to eat with our hands or a fork. After all, the filling was quite thick with plenty of chicken. I found it tasty though it could have been crispier. I think the filling was too wet and thick though to be as great of a quesadilla it had the potential of being. 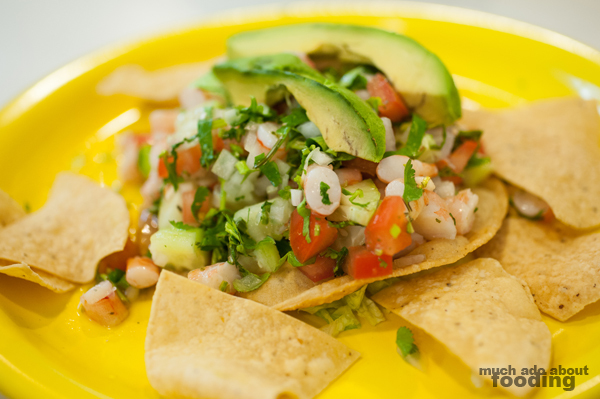 When the shrimp ceviche came out, it looked fabulous. Piled atop a tostada and surrounded by extra chips in case we were going to spill over (well of course you would! ), the ceviche was ever so bright with greens, reds, and oranges. I was excited since I love ceviche. 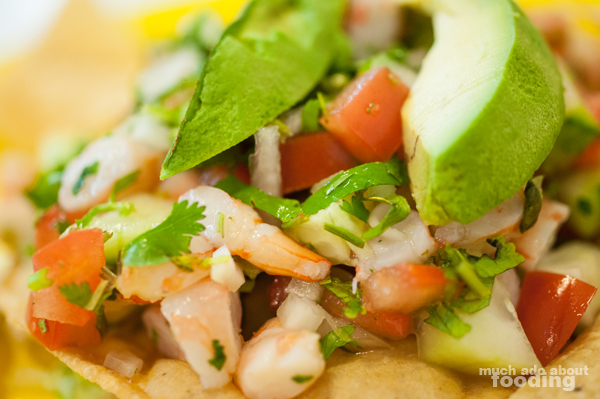 This version didn't wow me however and in fact, some of the shrimp seemed overcooked! How unfortunate considering that the lime was just enough. There was fresh avocado on top too which was a nice touch. It just didn't really jive with either of us and the dices were a tad too big. Hopefully it's not always like that? I'll give props to the service though because they were certainly easy to talk to. We'll think about coming back if we're in the area again.